I’m seriously behind on my blog. I apologise for that. I’m not quite sure where the time has gone, and I seem to have ‘lost’ a couple of weeks in January! But times have been busy and they have been good too! 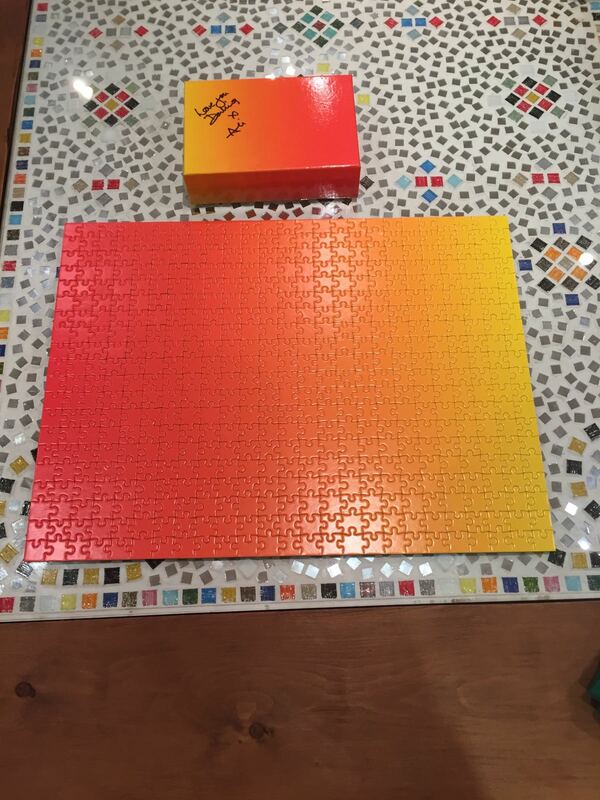 I think part of my lack of blogging had to do with the fact that I became obsessed with doing a gradient puzzle. 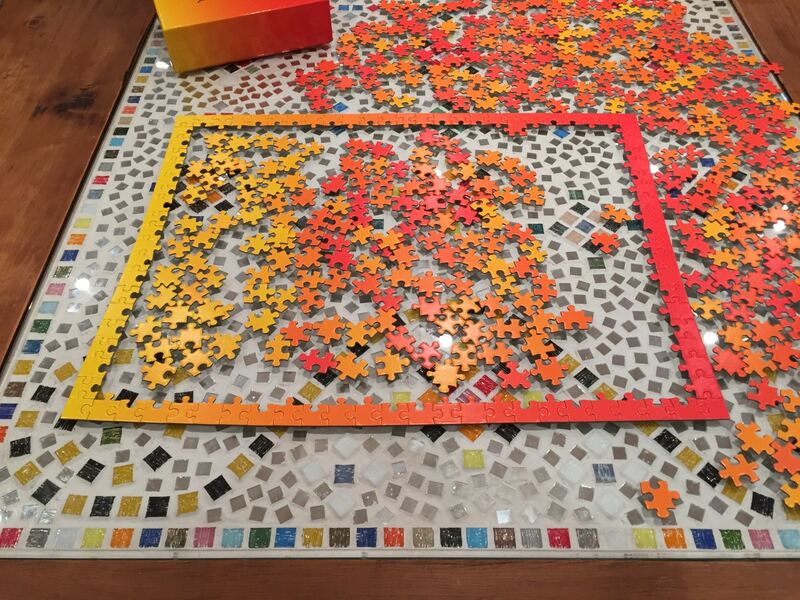 A type of puzzle that I’ve never attempted before. It was such fun to do. I’m going to hold off getting another one for now! Because I want to write down all the ideas and thoughts that came to me while I was focusing on putting all the pieces into their correct places. 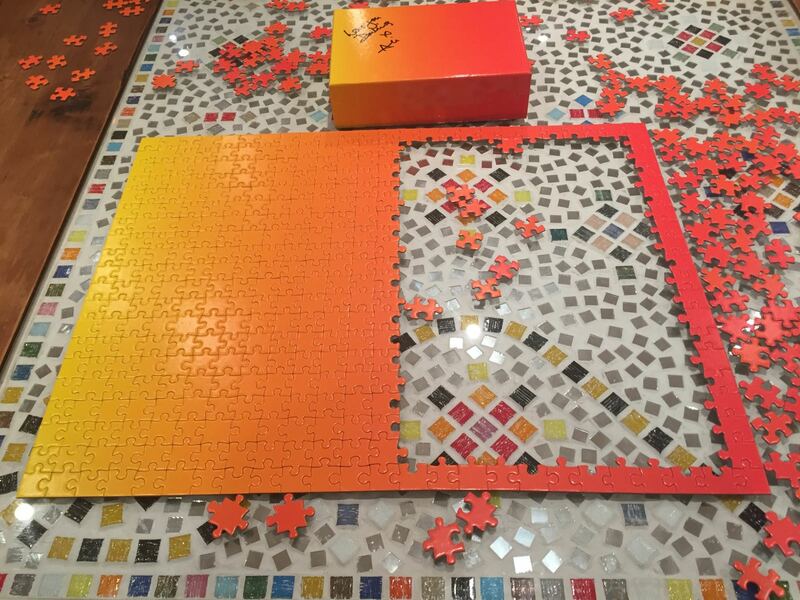 Doing puzzles seriously feeds my creativity. Below are a couple of before and after photos! Catriona had so many questions after she had read the book that she asked if I would like to participate in a Q&A. Of course, I jumped at the opportunity! I enjoyed thinking about and then answering her questions. You can read my answers here. Thanks, Catriona. It was a fun exercise. Sensitive, gentle and thoughtful soul. I want and need to know more about you and I want to tell you more about myself. I haven’t wanted to tell you anything that might put a blot on the excitement of your first visit in twenty years. I haven’t told you what happened after your last visit. But I will. When we meet. I haven’t told you where I had been in 2004. I want to tell you all these things now when we meet. Tomorrow. I also want to tell you my reasons for not having told you before now. But I’m not so sure I know what these reasons are any longer. I have so much to tell you. So much has happened in my life. And there is so much I want to hear about you and your life. I have so much more I want to share with you, I think to myself. I should have said something before. I don’t know why but suddenly I am overwhelmed with the idea that now is the time to tell you what I should have told you some twenty years ago. I am your secret. Perhaps it was time to tell you one of mine. Now was as good a time as ever. To tell you. To tell you the truth. To tell you what happened. To apologise. I don’t know. I must be careful. What the outcome would be I didn’t know. But I had to tell you. Well, the truth is I wanted you to know. Because of your imminent arrival. The thought of looking you in the eye and not telling you after all these years was an impossibility. You would see it on my face before the words came out. I knew that you would still have the ability to read me like a book. You read about people like us all the time. They all have their own reasons for why they can’t be together. What were our reasons then? I can remember. What are our reasons now? I can’t answer that one. Always so many questions. And so few answers. We are surely not isolated in our situation? your way back from a convention in France. The last time I had seen you we had shared a lingering kiss. In my car. On the forecourt of my local tube station. I had been nervous that we would be seen. That our kiss would be spotted. I was not nervous that we would be seen at Shepherd’s Bush tube station. Where we are meeting tomorrow. I cannot wait. I am beyond excited.